Sulzer Mixpac Ltd (SULZER) operates globally in the field of static mixing tips, cartridges and dispensing devices for the dental sector. 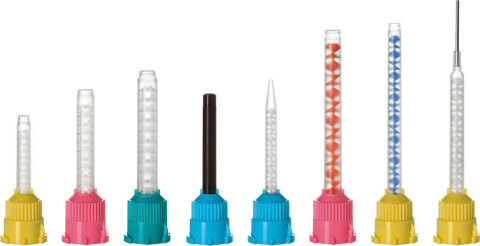 In recent times, substantially identical copies of the static mixing tips for two-component cartridges and syringes have increasingly been discovered. These copies by other manufacturers are not subject to SULZER’s strict quality controls and are therefore not covered by its warranty. In the interests of its clients, SULZER will continue to take legal steps against all such copies. SULZER has continued to successfully enforce these rights over the years in many dozens of court actions against, or out-of-court settlements with, slavish imitators of its mixing tips as well as to successfully enforce its patent, trademark or other IP rights against certain infringing colored mixing tips in many countries, such as Germany, Japan, the US and the UK. In addition, a total of eleven preliminary injunctions due to unfair competition were obtained from the Cologne District Court against various providers of slavish copies of SULZER’s mixing tips during the IDS 2017 by which inter alia the offering, advertising and marketing of these copied mixing tips for the dental sector were prohibited. Furthermore a preliminary injunction from the Dusseldorf District Court was served at the IDS 2017 on an exhibitor offering dynamic mixers infringing SULZER’s European patent, EP1943012. We recommend that you will continue to take great care to ensure that you actually do receive the original mixing tips from Sulzer Mixpac. We can only guarantee the proven high MIXPACTM quality for original MIXPAC dental products made exclusively by SULZER at its automated clean room factory in Switzerland where strict quality control, close tolerances and rigid cleanliness standards produce mixing tips of the highest quality, safety and reliability. Sulzer’s innovative T-Mixer™ that offers superior mixing performance with less waste is becoming the preferred choice for mixing tips. MIXPAC mixing tips are the industry leader for 2-component static mixing solutions for dental applications. The mixing tips have a Dome shape and CANDY COLORS™ (yellow, teal, blue, pink, purple and brown) registered as trademarks in several countries used with a materials cartridge. The MIXPAC system is also protected by European, U.S. and other national patents. MIXPAC dental products are made exclusively by Sulzer at its automated clean room factory in Switzerland where strict quality control, close tolerances and rigid cleanliness standards produce mixing tips of the highest quality, safety and reliability. With more than 850 employees, Sulzer Mixpac Ltd. is a world leading manufacturer and supplier of cartridge-based metering, mixing and dispensing systems and disposable mixers for reactive multi-component materials. As part of the Sulzer group, Sulzer Mixpac Ltd. can draw on a strong international network. The head office is located in Switzerland. For optimal service to its customers, subsidiaries are located in the U.S., UK and China. MIXPAC™ – is a registered trademark of Sulzer Mixpac Ltd., Switzerland. T-MIXERTM – is a registered trademark of Sulzer Mixpac Ltd., Switzerland. CANDY COLORSTM – is a registered trademark of Sulzer Mixpac Ltd., Switzerland.